Russia, Novgorod, the XVth century. Belonged to Evfimy, the archbishop of Novgorod the Great. The Moscow Kremlin workshops, 1535. Belonged to Prince Ivan Kubensky. The Moscow Kremlin workshops, 1591-1600. The Moscow Kremlin workshops, 1618. Gold, silver, precious stones, pearls, forging, niello. 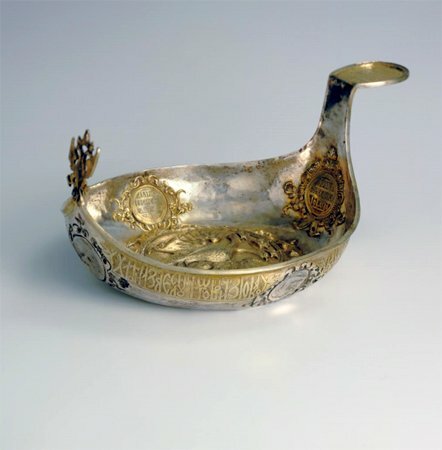 Belonged to Tsar Alexey Mikhailovich. Belonged to merchant Filat Khlebnikov. 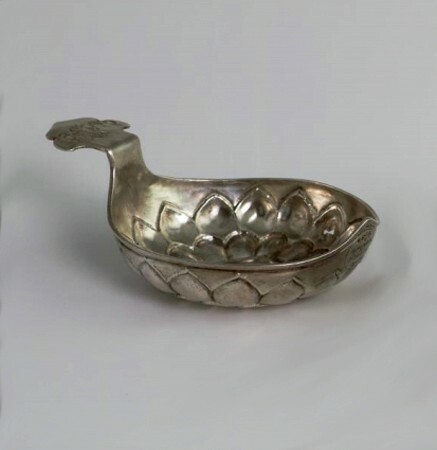 Adrinking ladle or dipper - kovsh - is one of the most distinctive articles of the Old Russian tableware. Archaeological excavations have revealed that wooden vessels of this type were in use in Rus by the XIth century. Its graceful outline recalled that of a boat or a water bird. 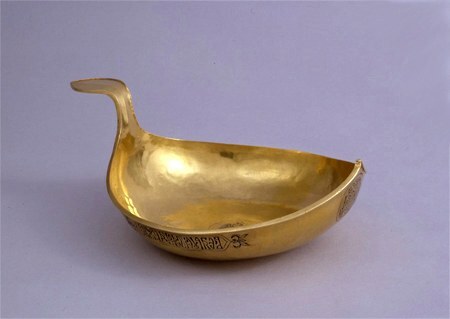 In the XVth century Novgorod makers reproduced forms of the kovsh in gold and silver which became a basic tendency widespread through the country. 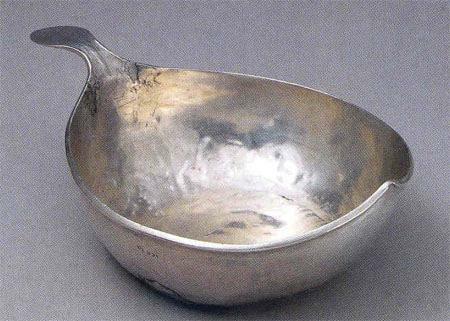 Such dipper was generally called according to its intended purpose, for example "guest, "home", "presentation", "burial" or "mead" kovsh. 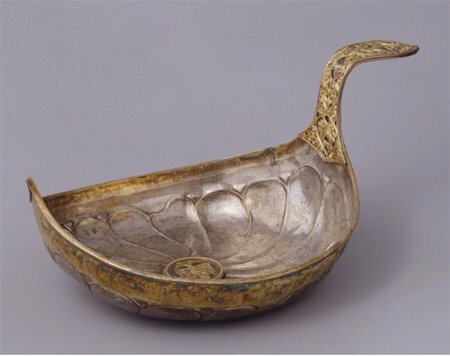 People traditionally drank meads (honey beverage) from this vessel. White mead was drunk from a silver kovsh, and red mead from a golden one. Kovshs were also used as gifts, rewards for military valour, ambassadorial or loyal service. 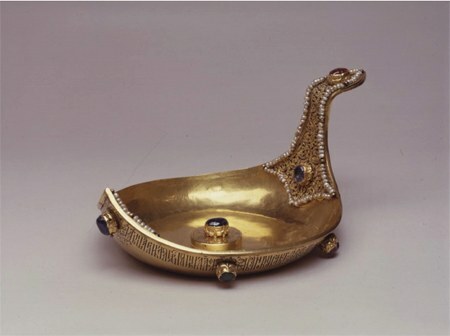 Along with the regalia and other articles of the court ceremonials these vessels were kept in the Treasury and were served only on special occasions in the Faceted Chamber. Displayed on a dresser-postavets (shelves trimmed with precious fabric), they were intended to demonstrate to foreign visitors the wealth and power of the Moscow sovereigns as well as workmanship of Russian goldsmiths. The Armory possesses three gold kovshs, executed for Tsar Mikhail Fyodorovich and renowned for their elegant forms and magnificent decor.